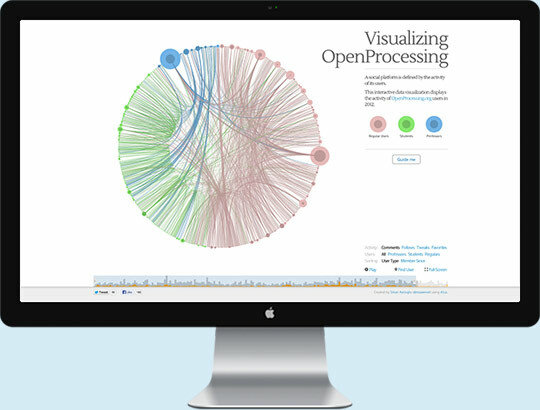 As 2012 year-in-review project, I designed and developed Visualizing OpenProcessing, an interactive data visualization of OpenProcessing users. “Current analytics tools like Google Analytics are great at showing user-to-page interactions but they lack user-to-user interactions, which is the essence of any social platform. 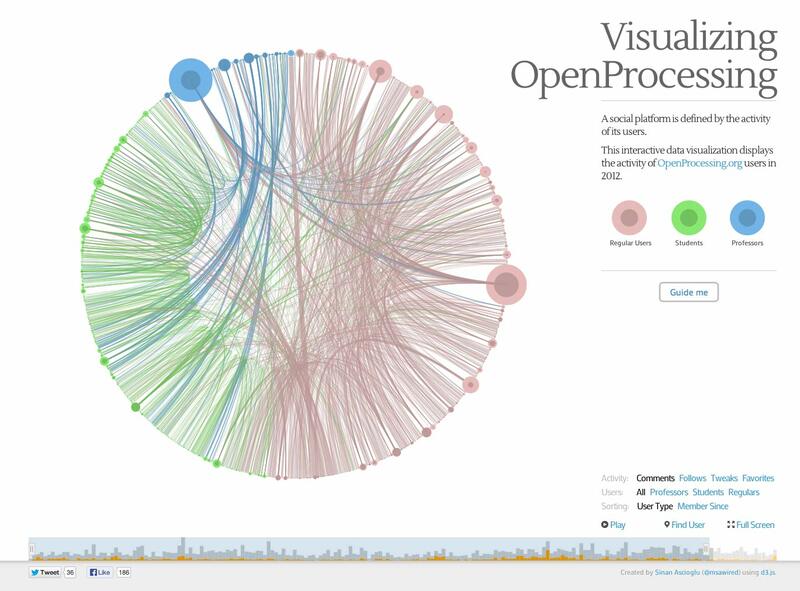 I wanted to understand the emerging patterns behind how users interact with each other on OpenProcessing. That’s why.”, I would reply..
You can select the time duration displayed in the visualization. In slower devices, timeline limits the time duration selected without effecting the performance. Outer circle represents the activity user received. Inner circle represents the activity user posted. This guide walks you through the various levels of the visualization as well as highlighting various patterns that emerged. Data displayed can be filtered by activity and user type. You can also play the selected time duration as timelapse. It took me some sketching and some coding in d3js to find the right visualization format. After creating a prototype using dummy data, I connected the database and made tweaks for performance and simplicity. I explored some color options with colorbrewer to find the best contrast while each category having equal visual weight. Finally, I added some editorial section providing a walkthrough to help read the visualization. Students interact with other students often, but still enjoy occasional interaction with the rest of the users. In contrast, Professors focus highly on their students and they interact less with the rest of the users. 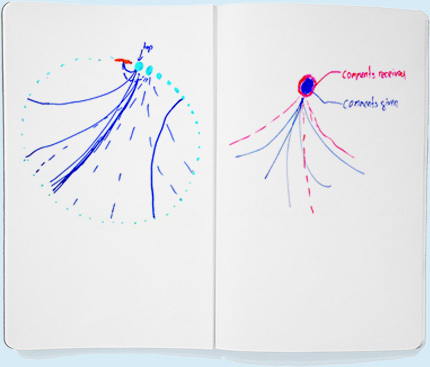 Other users on the site (regulars) are more active, overall, and prefer non-vocal interactions, such as “following” users or favoriting sketches, as opposed to vocal interactions, such as commenting or forking sketches. They also occasionally reach out to students to help. Designed with ♥ in Brooklyn, NY.